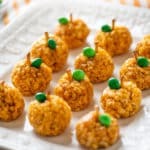 These cute pumpkin rice crispy treats are super popular with kids and parents love them because there’s no food coloring! Marshmallow rice crispy treats are a classic snack for kids and such an easy treat to make. 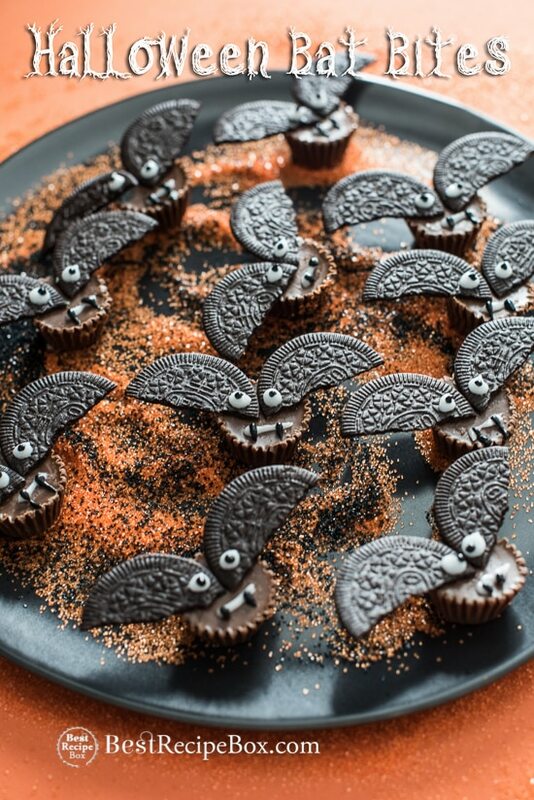 When Halloween rolls around, serving these are still popular but make them extra fun by shaping them into pumpkins! 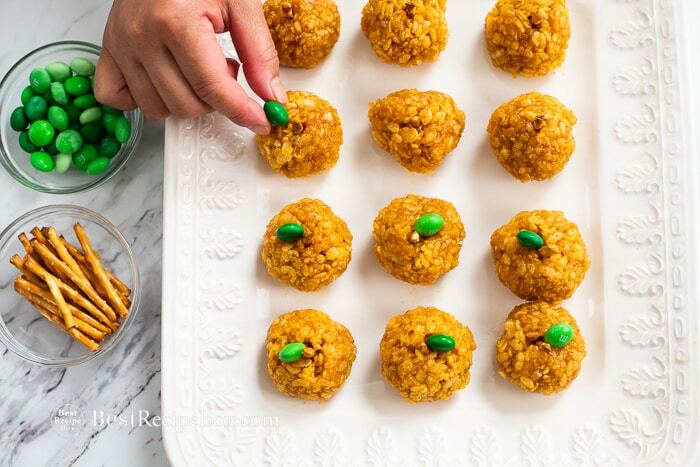 Our version for Halloween is pumpkin rice crispy treats and the added pumpkin puree makes them more nutritious. But what makes our pumpkin rice crispy treats so great is that we do not use food coloring to achieve the orange pumpkin color. Our pumpkin treats are all natural and the color comes from the pumpkin puree. 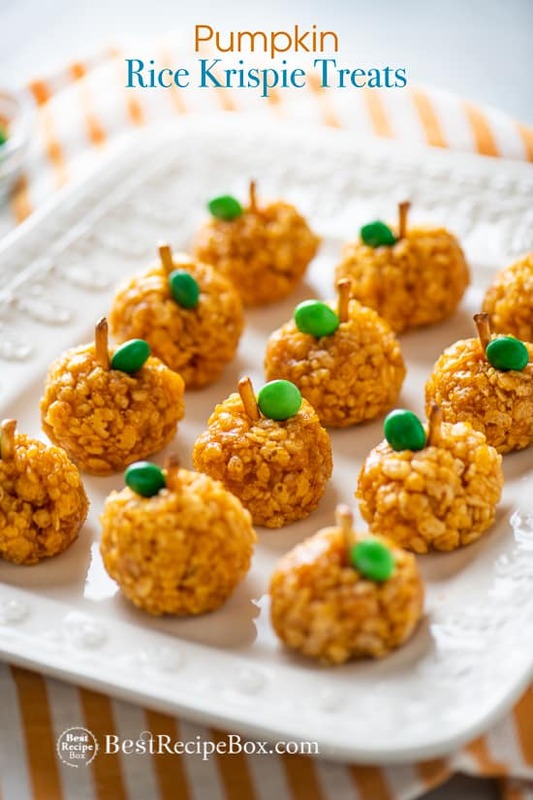 We wanted to give Moms a version for pumpkin rice crispy treats without food coloring. These still taste great and although you’ll get a slightly softer and chewier rice crispy treat, it’s still festive and delicious. Add some pumpkin pie spice to these rice crispy treats to make them more flavorful for the season. These are such a fun, delicious and easy way to celebrate Halloween and make your party more festive and colorful! For best results use fresh marshmallows. There’s no food coloring in our recipe. The pumpkin puree adds the natural orange color and flavor. But it also makes for a slightly softer and chewier treat. 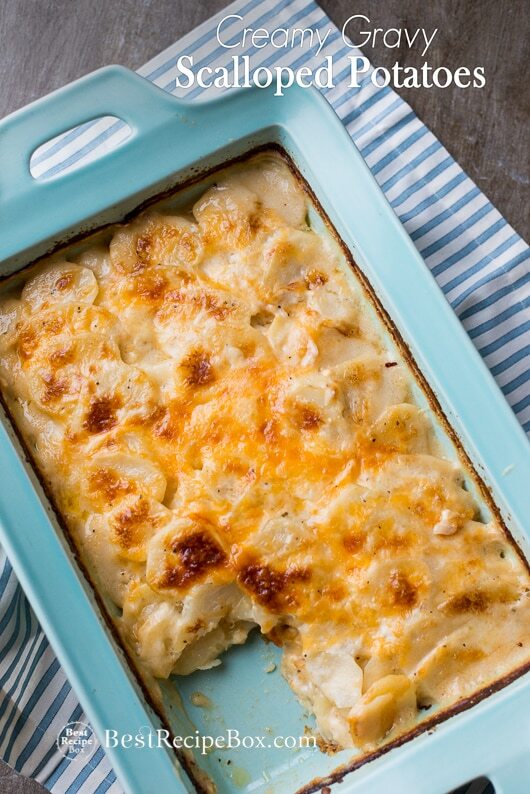 The slight compromise on crispy texture is better than using food coloring! If you use the pumpkin pie spice, it’ll make these treats a slightly brown color. But better flavor! Heat large saucepan on low heat. Melt the butter and then add the pumpkin puree. Heat until fully warmed and then add marshmallows and optional pumpkin pie spice mix. Gently stir until the marshmallows are melted, then remove saucepan from heat. Add rice cereal and stir the whole mixture until all the cereal is coated in the melted marshmallow mixture. Allow the mixture to slightly cool to touch, but not too much or else it’ll be too hard to form the pumpkin shapes. 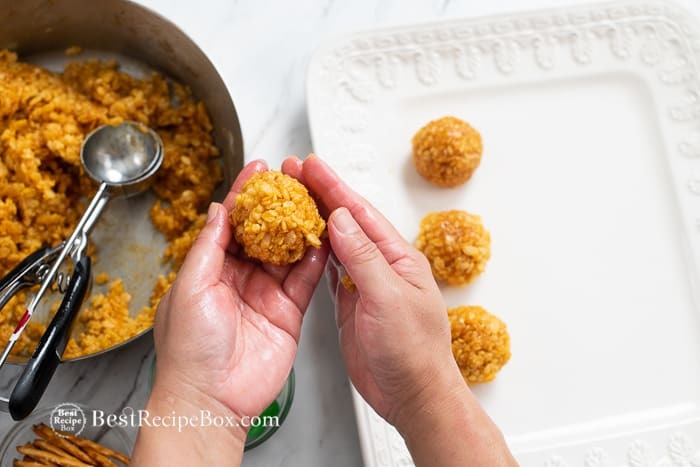 Coat your hands or a large cookie scoop with oil, and then form the rice crispy mixture into balls. 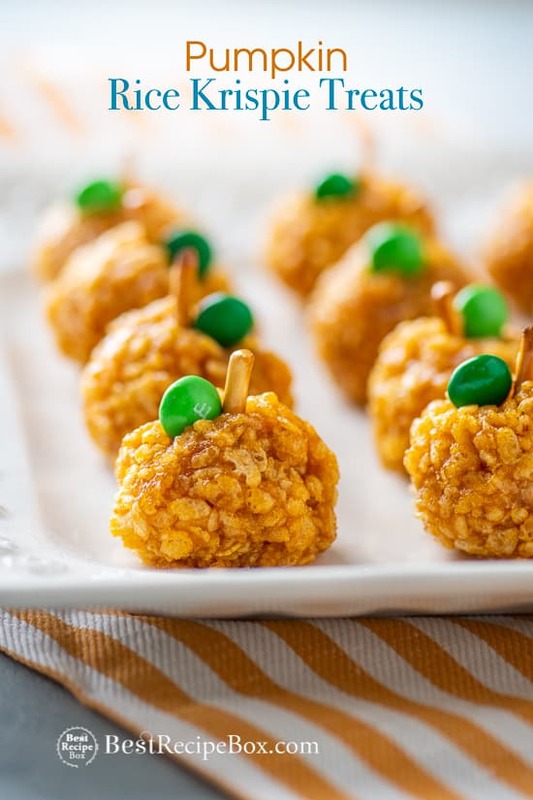 Stick a piece of pretzel into the top of the pumpkin crispy treat for the stem. Add a green M&M for the leaf. Allow to cool until firm and enjoy!